Self-feeding, applicator stick makes it easy to apply the right amount of Loctite product without it dripping onto surrounding parts. Semi-solid, no drip formula applies smoothly and consistently to ensure full thread coverage with less waste. Unbelievably mess free, so you spend less time cleaning up after a job. 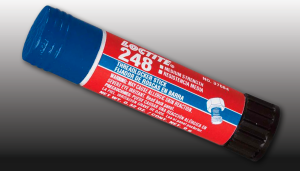 Medium strength threadlocker eliminates loosening from vibration, shock and thermal expansion. The perfect choice for your next project!